The Australian market ended Friday’s session mostly flat. 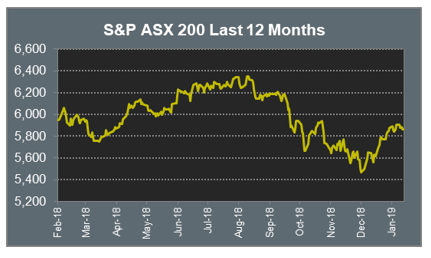 Over the course of the week the ASX 200 index gave up 0.1%. The major banks were mixed ahead of the final report from the Royal Commission, which is due to be publicly released after market close today. ANZ fell 0.40%, NAB lost 0.29% and Commonwealth Bank dropped 0.21%, whilst Westpac bucked the trend, rising 0.12%. Private Hospital operator Healthscope rose 3.81%, after announcing the takeover offer from Brookfield has progressed to the next stage. The Australian futures market points to a 0.34% rise today. US stock markets were mixed on Friday night. The Dow rose 0.3% and the S&P 500 edged up 0.1%, while the NASDAQ fell 0.3%. Amazon.com announced its fourth quarter sales after the market closed on Thursday. Net income increased to US$3.0bn in the fourth quarter, or US$6.04 per share, compared with net income of US$1.9bn, or US$3.75 per share, in fourth quarter 2017. Despite the positive result, shares in Amazon.com fell 5.38% on Friday. 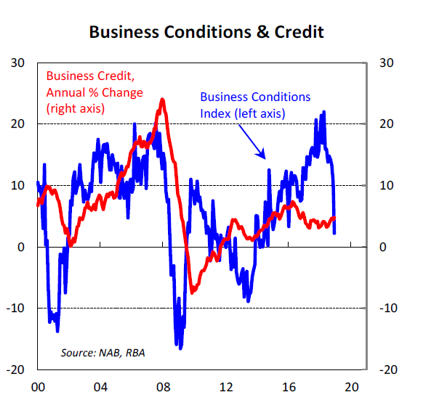 It should have come as no surprise that Australian Business Conditions and Private Sector Credit recorded weak results for December. Offshore influences with downside risks to the global economy have been growing in recent months, and have contributed to the shift in business sentiment. The longest shutdown of the US government in history, disappointing Chinese growth figures, Brexit and a possible recession in Italy are conspiring to increase concerns about global growth. These offshore concerns are spilling over into share market volatility and possibly causing caution among businesses and consumers. Domestically, housing lending was the weakest annual rate since July 2013, and contributed to the slowest annual growth rate in private sector credit since February 2014. Other personal credit, which includes credit cards and personal loans, is down 2% over the year. The soft pace of credit growth is not encouraging for the domestic economic outlook, particularly given the plethora of downside risks present both domestically and globally.